We spent a delightful day relaxing at this gorgeous resort. They do in fact sell day passes (for a very affordable fee). The beach itself is gorgeous. Like most hotels on this side of the island, they’ve built a barrier to block the major waves- making a small inset with calm, warm water to make swimming easy. There are lots of beach chairs with both shade and sun. Food was relatively expensive but quite delicious. We ate at the pool bar which had some healthy but still delectable options. This hotel has one of the best locations if you happen to be arriving by cruise ship as it’s just next door to the cruise ship pavillion. It definitely has one of the most unique pools we’ve ever been to! 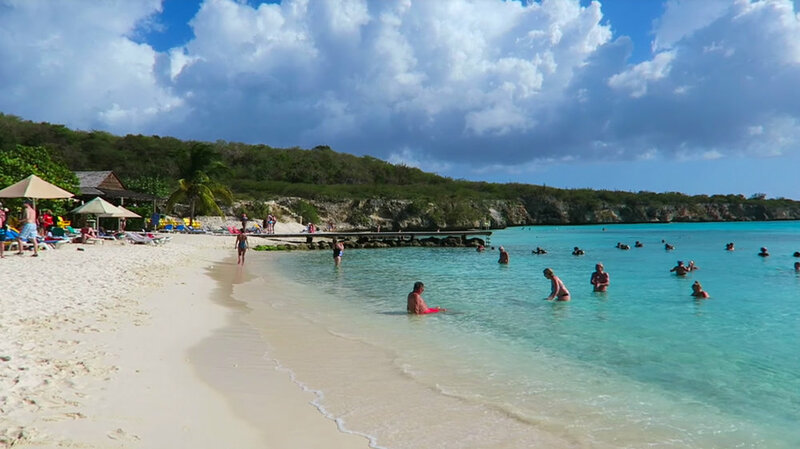 Because the Renaissance is in the middle of Willemstad, it doesn’t have it’s own natural beach. However, they’ve remedied this by making their own man-made beach. It definitely has the feel of being on a beach, but you also get the added benefit of an infinity pool. If you don’t like salt water, there is a freshwater pool right next to it. Definitely the most high end and luxurious hotel on Curaçao, you can also visit this place for a day! Like Avila beach hotel they have built a barrier to keep the water calm and inviting- however, they also added a little island while doing this. They have some of the most comfortable beach chairs EVER! 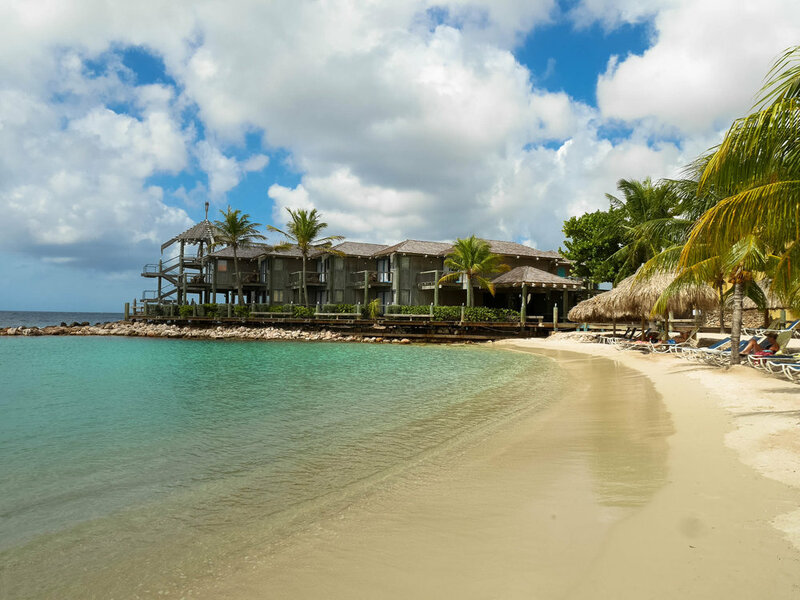 This place is pure bliss and you’ll feel so privileged to be able to experience their incredible beach and restaurant for the day that you’ll likely want to come back to stay! Okay, so admittedly not a beach, this is still one beautiful pool to spend the day! It’s along the ocean with big waves lapping up against one side of the compound- meanwhile you’ll be enjoying a fantastic cocktail while lounging beside their incredible pool. This is such a great place to spend the day, especially if you’re a pool person! Seriously one of the most beautiful beaches on the island, and perhaps in the Caribbean. Not too much here for services as far as restaurants go, but the views are incredible, plus you can rent chairs and umbrellas and the water is warm, clear, blue and absolutely stunning. You don’t want to miss this spot while in Curaçao. Another incredible beach on this island- Porto Marie has a few more amenities than Grote Knip but is also quite a bit busier. The restaurant here is surprisingly good and relatively well priced considering the surroundings. Beach chairs also cost a few dollars, but still affordable and totally worth it considering how great the water is. Bonus- there are beach pigs!!! I kid you not- we encountered a couple of pigs running around the premises, trying to charm the inhabitants. As we didn’t get to visit all the beaches and beach clubs while on our stay, this is not all encompassing, what did we miss? Do you have a favourite beach or beach club on the island? Let us know in the comments!